But Moses said to God, “Who am I that I should go to Pharaoh, and bring the Israelites out of Egypt?” He said, “I will be with you; and this shall be the sign for you that it is I who sent you: when you have brought the people out of Egypt, you shall worship God on this mountain.” But Moses said to God, “If I come to the Israelites and say to them, ‘The God of your ancestors has sent me to you,’ and they ask me, ‘What is his name?’ what shall I say to them?” God said to Moses, “I AM WHO I AM.” He said further, “Thus you shall say to the Israelites, ‘I AM has sent me to you.’“ God also said to Moses, “Thus you shall say to the Israelites, ‘The Lord, the God of your ancestors, the God of Abraham, the God of Isaac, and the God of Jacob, has sent me to you’: This is my name forever, and this my title for all generations. Exodus 3:1-15. I found this reading in the Daily Office for today. The passage begins with Moses engaged in an everyday sort of task. He’s tending to his father-in-law’s flock; he’s working. Moses has not set out on a spiritual journey, he hasn’t gone into the desert to retreat and encounter the Infinite. Like most of us, God confronts Moses when he’s busy trying to do something else. We should also note that Moses is pretty much homeless when this remarkable event happens. Although an Israelite child, he was adopted by the Egyptians and lived among them until he killed an Egyptian overseer. He runs away from the wrath of Pharoah into the land of Midian. And as we know from the balance of the story, Moses will spend the bulk of his life wandering. (It’s a bit ironic that he ends up finding a homeland for his people, but not for himself.) In fact, Moses offers a revealing glimpse into himself when he says, “I have been an alien living in a foreign land.” Gen. 2:22. I think lots of folks feel that way, constantly looking for a home. 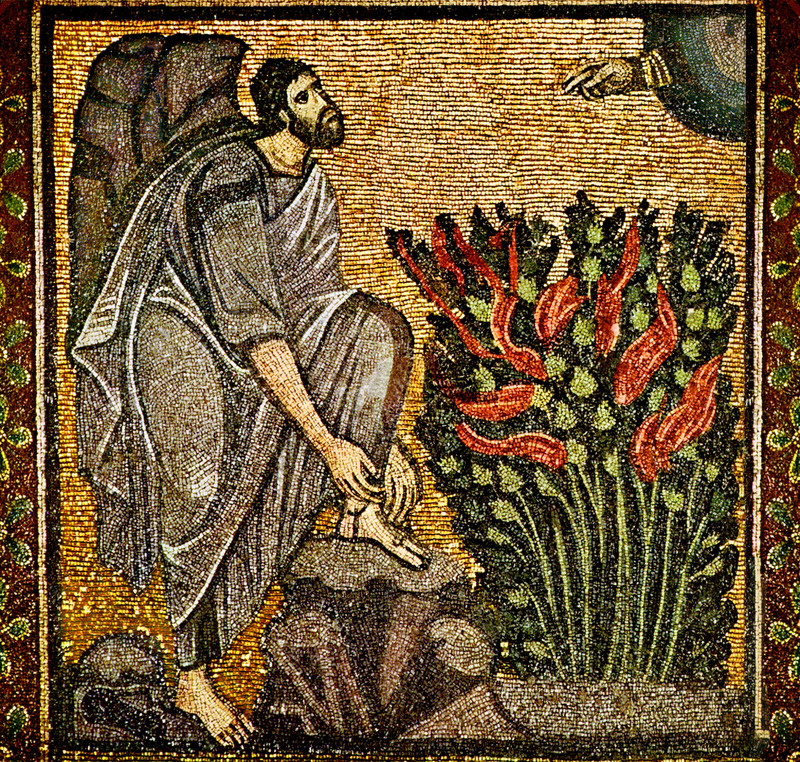 As Moses encounters this burning bush, YHWH tells him to remove his sandals because he is standing on holy ground. The removal of one’s sandals not only signifies that one has arrived at a sacred space, but also (within many cultures) suggests that one has entered a home. Therefore Moses, the wanderer, finds his home with the Lord. Two questions from this passage echo into each of our lives, and will shape the course of our faith. The first is the question Moses asks of the Lord: “Who am I?” Moses wants to know his own authority to preach truth to power, and it’s a question most of us have faced at one time or another. Who am I to be God’s voice in this troubled world? Who am I to speak out against something that’s wrong? We should find the second question equally troubling, and equally determinative for us. Moses asks the Lord (the God of Abraham, the God of Isaac, and the God of our ancestors), “Who are you?” Moses wants to know exactly what he’s going to tell people about who he met in the burning bush. He wants to understand the Almighty; he wants to know God’s name. The answer Moses heard, “I AM WHO I AM,” probably didn’t leave him completely satisfied. The name “I AM” obviously conjures up so many of Jesus’ “I am” statements (the bread of life, the light of the world, the good shepherd, etc). In this case, however, we might find particular encouragement in Jesus’ assurance: “I AM with you always, even to the end of the age.” Matt. 28:20. Many of us still hear the reverberations of these two questions, “Who am I?” and “Who is God?” As we begin to answer them, I think we may find the story of Moses even more rich. Once Moses begins to understand the answers (a rudimentary and incomplete understanding) God immediately sends him on a mission. In Moses’ case, the mission involves confronting Pharoah and leading the people into Israel as God saves His people. In our case, that mission may be completely different. But only through that journey, which will last for the rest of his life, will Moses come to more fully understand who God is and who Moses is. The journey leads him to a deeper understanding of YHWH, which leads him to a deeper understanding of himself, which leads him further along the journey. I believe that’s part of the reason why the Exodus became the overarching narrative of the Jewish people, and why it remains so important today. From Mount Hor the Israelites set out by the way to the Red Sea, to go around the land of Edom; but the people became impatient on the way. The people spoke against God and against Moses, “Why have you brought us up out of Egypt to die in the wilderness? For there is no food and no water, and we detest this miserable food.” Then the LORD sent poisonous serpents among the people, and they bit the people, so that many Israelites died. The people came to Moses and said, “We have sinned by speaking against the LORD and against you; pray to the LORD to take away the serpents from us.” So Moses prayed for the people. 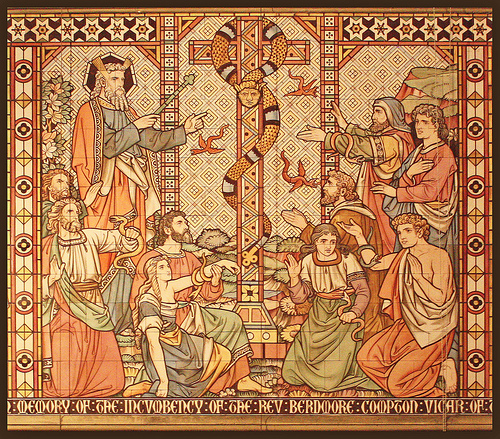 And the LORD said to Moses, “Make a poisonous serpent, and set it on a pole; and everyone who is bitten shall look at it and live.” So Moses made a serpent of bronze, and put it upon a pole; and whenever a serpent bit someone, that person would look at the serpent of bronze and live. Numbers 21: 4-9. Jesus said to Nicodemus, “Just as Moses lifted up the serpent in the wilderness, so must the Son of Man be lifted up, that whoever believes in him may have eternal life. “For God so loved the world that he gave his only Son, so that everyone who believes in him may not perish but may have eternal life.” John 3: 14-16. The first passage, from the Book of Numbers, deeply challenges our understanding of Yahweh, and confronts our imaginations. It takes place against the backdrop of the consistent theme within the Exodus narrative: forty years of wandering in the wilderness, marked by the people’s resistance, God’s punishment, the people’s repentance, and God’s restoration. As the people near the end of their journey, a campaign of rebellion arose against both Moses and God. The text reports that God addressed this issue through an infestation of seraphs (poisonous snakes). In this fitting Lenten passage, when the people acknowledge their complicity for their situation, God intervenes to save them. God instructs Moses, who creates a bronze serpent placed upon a pole. 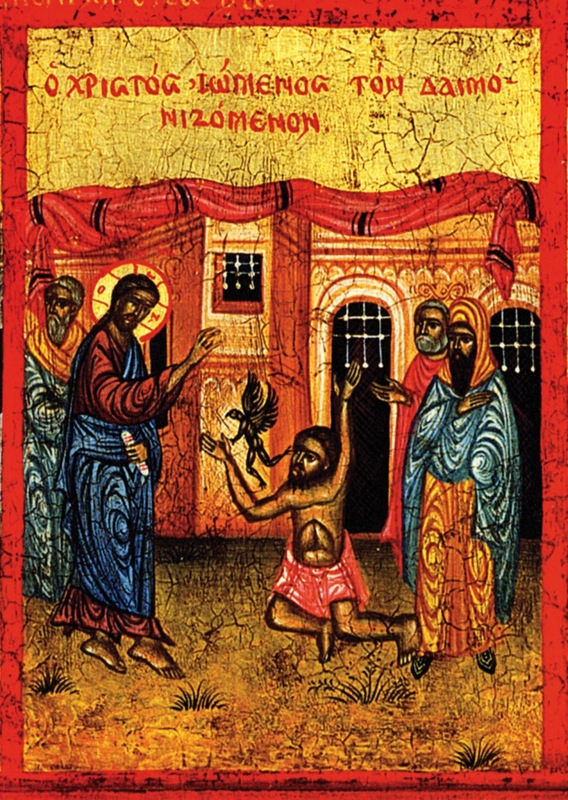 When those bitten by snakes look upon this image, this icon, God heals them. Out of this destructive pattern of sin and death, God will raise up a way of healing. This leads us to the Gospel reading for today. In the Gospel passage, we encounter the terribly interesting figure of Nicodemus, a Pharisee who secretly followed Jesus. Immediately prior to this passage, Jesus challenges Nicodemus’ imagination, teaching about the need for a man to be “born again”. Jesus then reveals his messianic role, drawing on the iconic image of Moses lifting up a serpent in the wilderness. This statement carries with it the double-meaning of the Christ being raised up as the Messiah and of Jesus raised up on the cross. As with the earlier passage from Numbers, Jesus describes a spiritual reality that the world cannot yet comprehend. Jesus teaches Nicodemus that believing in the Son “lifted up” provides the way to eternal life. It’s important to note that the Greek phrase John uses isn’t actually “believes in him” but rather “believes into him”. In other words, Jesus isn’t describing an intellectual assent to a set of propositions, but rather a radical submission and new way of life. Jesus offers eternal life, therefore, to those who join in His way of life. Thus, St. Paul could accurately say “I no longer live, but Christ lives in me.” Gal. 2:20. John’s Gospel offers us a deeply rooted theology of the cross. In fact, for St. John, the cross operates as the fulcrum point upon which all of human history turns. This passage seems to answer, perhaps a little obliquely, Nicodemus’ question, “How can these things be?” John 3:9. Jesus points to a spiritual reality we cannot yet see, that we cannot yet understand. 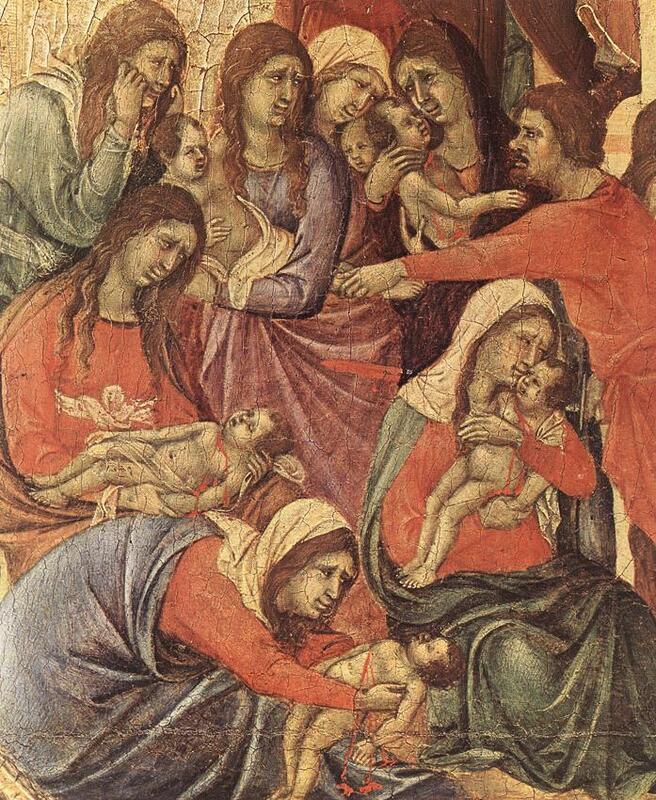 Our new life, our eternal life, in Christ originates in one mysterious, glorious, incomprehensible notion: “God so loved the world that he gave his only Son, so that everyone who believes into him may not perish but may have eternal life.” Salvation arises through God’s love, revealed on the cross. In the depth of this Lenten season, that’s good news. Moses and the Bronze Serpent © Fr. Lawrence Lew, O.P.